Keep bead patterns consistent and clean. The COPAR Model AMS Adhesive Monitor System verifies glue patterns applied to cartons, by electronically controlled glue extruders on Flexo folder-gluers. The system uses infrared cameras for single or dual pattern recognition. COPAR custom camera brackets allow easy changeover for “top-down” or “bottom-up” glue pattern monitoring. After desired glue pattern dimensions are entered and corresponding camera(s) selected, analog circuitry samples and stores data from the first glue pattern scanned by a camera immediately after the system is armed. 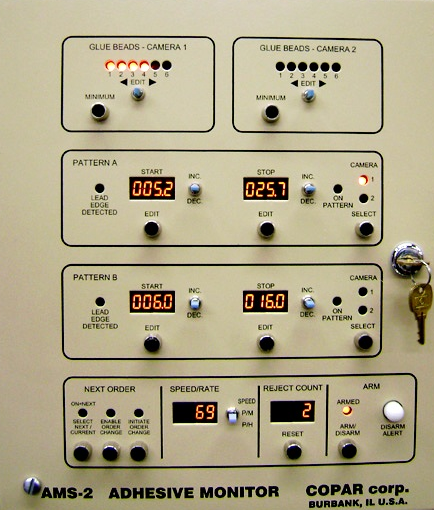 The stored data is used as a standard to compare each subsequently scanned glue pattern applied during a production run. Any carton with a glue pattern failing to meet the standard and/or minimum bead requirement will be counted and marked for removal, while an alarm sounds to alert operators. When a preset number of consecutive cartons are counted, feed interrupt and machine stop are activated. Use of the COPAR model AMS-2 Adhesive Monitor System ensures 100% inspect ion of adhesive application on even the highest speed Flexo folder-gluers. Any variation from a pattern standard-length, position, absence, relative quantity, skips or bead requirement will be detected. Detection of improper adhesive application will reduce waste, customer complaints and network cost.